Pro Performance Boot Cold Pack Insert - Sports Medicine for you and your horse! 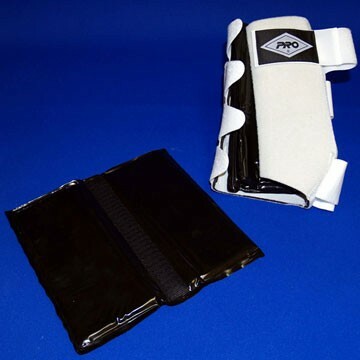 The H12 Reusable Cold Pack Insert is designed to fit in the H10 Performance Support in place of the foam liner. Using state of the art gel technology, these cold packs make treating your horse quick, easy and safe. The H12 Reusable Cold Pack Insert is designed to fit in the H10 Performance Support in place of the foam liner. Using state of the art gel technology, these cold packs make treating your horse quick, easy and safe. Designed with a non toxic glycerin base, it won't dry out or leak, even if punctured. The cold pack will remain flexible even at -20 º F, so it will easily conform to the leg for maximum benefit. Insert will maintain therapeutic cold for optimum treatment times of 20-40 minutes without fear of burning. Completely washable and reusable. Packaged in pairs, one size fits all.